When a researcher at Merck & Co. took a 12-year-old data set on breast cancer and visualized it, she was able to identify an unknown subgroup of cancer survivors helping her take a small stride towards finding a cure for cancer. Business intelligence uses data visualization, the graphical representation of data and information, to completely shift the way you think by helping you discover trends, patterns and correlations in your businesses. Uncovering insights help move us forward in a way we just couldn’t before due to a lack of knowledge, clarity or inspiration. Today, companies are overwhelmed by all the data flowing in from online interactions, customer behavior, sales reports, Excel spreadsheets and more. Before BI solutions, businesses needed to make decisions based on a hunch–not on numbers. Even critical decisions which often involved multiple data sets, big data such as all historical data, still meant that businesses had to absorb what they could and take an educated guess–which can also be a stab in the dark when it comes to the plethora of data found in most companies today. Once the realm of business intelligence was born and generated BI solutions that are fast, easy-to-use, and can crunch terabytes of data, visualizing data to make decisions based on facts became the smartest decision. Alpharooms.com is one of the UK and Ireland’s leading websites for discount worldwide travel, with one million annual customers accessing hotel rooms in more than 250,000 hotels in 40,000 destinations worldwide. The company needed to track web behaviors, email marketing activity, booking patterns, and their finances–and needed it in real time to be able to change prices and availability as quick as possible to maximize their services. Alpharooms.com uses a BI software to build reports and dashboards that analyze booking activity from every angle. With efficient reporting around each type of booking (hotel, flight, car, etc. ), they can now directly approach hotels for which they have enough bookings to avoid the extra cost of going through wholesalers. Other uses of the software include analyzing website usage patterns, optimizing email marketing campaign performance, optimizing purchasing strategies, tracking call center performance and conversions by rep and running reports on all customer activity by search keywords, travel destination, common packages and so forth. Example 2: See Where Your Target Audience Lives. Literally. The New York Times has jumped on board with data visualization and created an interactive, incredibly thorough census maps that shows the demographics of every block and city in America based race and ethnicity, income, education, and housing and families. Plug in your business and these demographics let you truly know your market segment such as their occupations, gender, location, hours of activity, and more, so you can build the best business plan possible. Discover if a target population is wealthy enough or educated enough to be interested in your product (or just the opposite) before you move forward. By researching and understanding the demographics of a particular population, business owners can successfully establish a business model and plan, expand a product line, or out-compete their competitors. Using business analytics, you can enable visitors to use their personal data to envision themselves as part of your story and get a feel for how they fit with your product. The BCG and World Economic Forum encouraged users to estimate the value of a specific solution to their business—instituting an employee wellness program– via an interactive graph. Executives could quickly calculate how much their specific companies could save by investing in such an employee wellness program based on the statistical data of other companies’ wellness programs. By letting prospect customers determine the economic benefits they could gain if they instituted the program, these companies literally visualized themselves as a part of the story that the BCG and World Economic were trying to push. Those who bought based on participating in the interactive graph in turn gave BCG and World Economic Forum information about their users, and became an invaluable sales tool for the business. 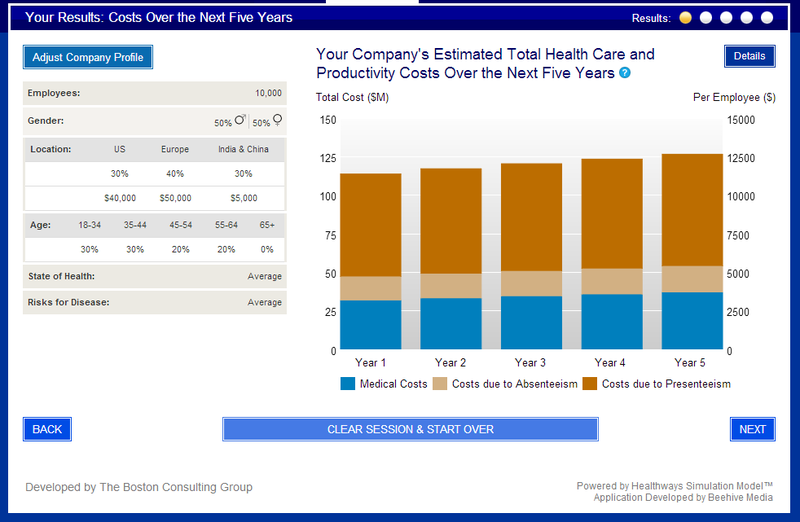 It was such a great success, a partner company uses these data visualization reports as a sales tool. Sharing your dashboards and reports, which many BI tools make easy via web-based dashboards, allows your colleagues or audience to fill in details or even add their own narrative. Every department in a company can build upon the business story by contributing data or drilling down into a specific segment and highlighting an aspect that is unique to them. In this way, interactive graphics encourage people to participate in the storytelling by adding layers of data and insights–giving you a richer understanding of your business. Read this article as originally published on data visualization here.